There are primarily two beach areas in Carlsbad CA. Carlsbad State Beach which is a family water-recreation beach for swimming, surfing, skin diving, fishing and picnicking. 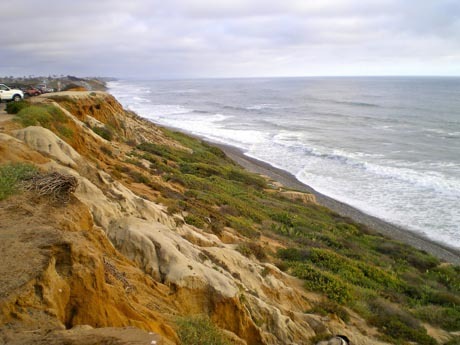 South Carlsbad State Beach is a camping beach with 222 campsites are located on the bluffs overlooking the beach. There are stairway accesses in the campgrounds leading to beach areas. Carlsbad State Beach is a 4-mile long beach that is sometimes referred to as Tamarack Beach since it is located at the foot of Tamarack Avenue in the city of Carlsbad CA. It is the most crowded area where you will see families enjoying picnics, barbecuing, swimming, sunbathing and playing volleyball. There are areas set aside for surfing, boogie boarding kayaking and fishing. There are jogging trails on the bluffs and down the beach areas. Walkways on the beach permit roller-blading and is dog-friendly with leashes. The beach is located near Carlsbad Village where you will find nice dining restaurants and boutique shopping on Carlsbad Village Drive. Getting To Carlsbad State Beach. From Interstate 5 exit at Tamarack Avenue, Cannon Road or Carlsbad Village Drive West to Pacific Coast Highway. Parking is a mixed bag with small beach parking lots and roadside spots. South Carlsbad State Beach is a camping beach. There are two sections that combined feature 222 camping sites that set on the bluff overlooking the beach. There are no day-use facilities in the campground but the beach area is open to daily public use. The most scenic camping spots are those with ocean beach views. There are several stairways located in the campgrounds that lead down the bluffs down to the beach. This is one of the most popular campgrounds in the San Diego area and can get quite crowded, particularly during the summer months. Reservations are a must. In fact, reservations often fill up six months in advance on the day they are released. The campground is divided into two sections by the camp road that runs down the middle between the sections. Token-operated showers are available to campers. Token machines are located at the camp fire center and ranger system. A camp store located near the campground entrance operates March through October and provides all the amenities a camper may need including some RV supplies, boogie boards, firewood, and fishing gear. Getting To South Carlsbad State Beach. From Interstate 5, take the Poinsettia exit west to the campground gates. The address is 7201 Carlsbad Boulevard in Carlsbad, California. For guidelines, safety and other information, visit the State Parks website. Carlsbad California Beaches. Ponto Beach.